ARE YOU happy with your weekly salary? Are you 100% independent financially? Do you live the kind of life you want… with no financial stress or restrictions? If you answered ‘no’ to any of these questions then the Profit Maker Method is for you. Therefore, I researched it and reveal my findings in this Profit Maker review below. Keep reading and I will show you exactly what it is… And what it is not. My Verdict: SCAM and a deception!!! Keep your hands off! Are you interested in making REAL Money Online? If that’s what you want, do NOT ask Binary Options to a dance? Why? The answer is simple – Binary Options are NOT for the average Joe (or Jane). It is high-risk business opportunity and if you decide to trade with Binary Options, be prepared to lose all of your investments. There are much better (and safer) ways for newbies to start making money online. However, in my opinion, one of them is the by far the best for newbies. Check My Top Choice Here! See whether it is for you. Note! Do not confuse the Profit Maker Software with the Profit Clicking (AKA Ad Click Xpress). These two are completely different animals. Long story short, Timothy Hollingdale, an experienced banker and trader discovered a secret profit formula which allowed him to develop a unique binary options trading software. He called his software The Profit Maker Method. This software is fully automated and has made Mr. Hollingdale several millions of dollars in the last few years. Also, the software is heavily tested and has proved to have a much higher performance level than any other similar app. 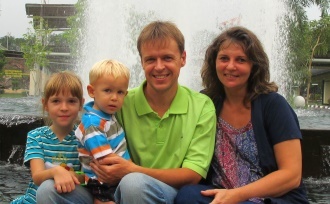 Now Timothy Hollingdale is offering his software to you for free – 30 day trial run. However, the time is running out fast. Once all free spots are taken, they will begin charging free members only. Don’t rush to sign up, though. Read the whole review before you do that. For you – no math, no confusing trading charts. Nothing complicated. Pretty impressive, isn’t it? But only if it is real. Unfortunately for you, it isn’t! And I am going to prove it to you now. It’s funny to read all those bogus positive reviews about Profit Maker that keep touting how honest and ethical businessman Timothy Hollingdale is. Because he does NOT even exist. The character (and the whole Profit Maker Method narrative) is pure fabrication. Timothy Hollingdale claims that for the last 12 years has trained marketing students throughout North America and the UK. For over a decade he’s been working with some of the biggest banks in the UK and abroad – Barclay’s, Morgan Stanley, Deutsche Bank, etc. However, when I tried to find some (ANY) traces of him… I found NOTHING! This must be a real phantom guy. Therefore, it does not make sense now to talk about Timothy Hollingdale, his trading achievements, or his top secret profit formula. All that is a bluff. And therefore, as you can see, there is no super-duper trading algorithm fueling the Profit Maker App. All they have is some crap Binary Options trading software – designed to lure you into the system and separate you from your savings. Websites use different trust badges to confirm visitors that their websites are secure. Norton Secured, First Data, and other solutions help to defend websites from different cyber attacks, prevent credit card fraud for their customers, etc. Which means, of course, that you are NOT protected at all. Terrible! Testimonials, as you know well, have one single purpose – to confirm you that the product is legit and produces real results. Plainly speaking, other people (ordinary people like you and me) have used the software and achieved success just as it was told to you. Now, what if all these testimonials are faked? What can you tell about the product (or software in our case) now? Do these fabricated testimonials raise your trust toward the software? Will you dare to do business with them? The big trouble is, that’s just exactly what you will have here. All the Profit Maker Method testimonials are fabricated. However, I did research on Jim Moody and his image. Yes, you are right! There’s no Jim Moody who is making money with the Profit Maker App. Plain and simple, the image is stolen from the internet and attached to a random name. 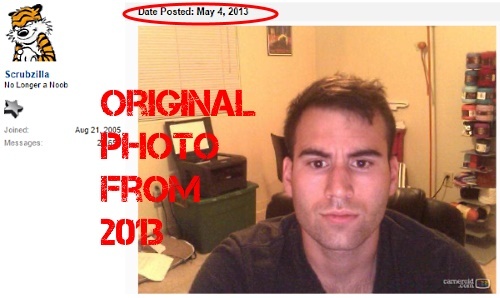 Also, you can see the same photo here. As you might suspect, this too is 100% bogus. The big trouble with binary options scams is that they will tie you to unregulated brokers. Yes, they give you their software for free. But it does not mean you can start trading right away. First, you need to open a new trading account with some binary options broker. Unfortunately for you, they don’t allow you to choose. The con artists have made deals with certain brokers (mostly unregulated shady offshore ones) so they will tell you that you can open your account ONLY with the broker of THEIR choice. The problem is not the account that you will open. The problem is that you need to fund your account with real money. YOUR money. You cannot file a complaint either (because it’s unregulated). And the free software, the app (in this case The Profit Maker Method) is designed from the beginning to make your deposit melt away as fast as possible. That’s their business and their profit which they share with the broker. And you… You are left licking your wounds. Therefore, be very, very careful! However, the secret behind these bogus reviews is that they don’t care about you. What they care about is how to make money on you. When they can persuade you to sign up with the system, they earn commissions. That’s why they are so desperate – “is very recommended,” “highly recommended,” etc., etc. There’s nothing wrong in earning commissions by introducing new customers to companies. But the product that you offer to people must not be a scam. If I promote a scam, I am a no better person from that scammer. There is nothing trustworthy in the Profit Maker Method. Nothing. Everything is a deception. The founder, the narrative, the testimonials, promises… Everything. Do you want to learn how make legit money online in a safe way? If so then, as I said above, do NOT mingle with Binary Options. Because, although at first glance, it appears quite simple and the deal looks great, it is not newbie friendly. Binary Options involve extremely high risk and you must expect to lose your investments. In fact, binary options scams, like this one here, are designed from the core to free you from your money. 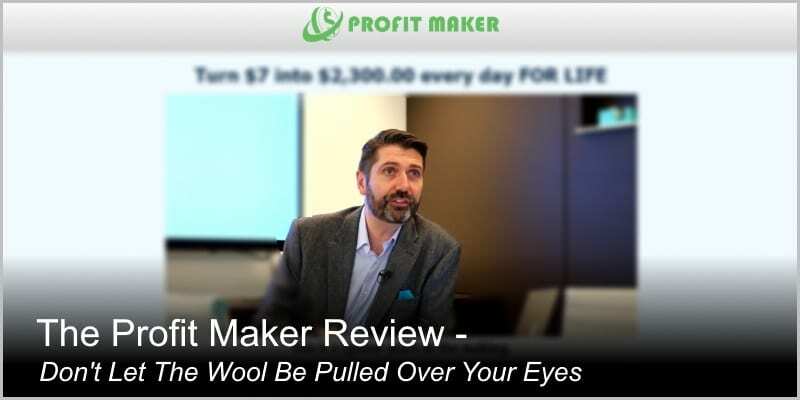 Now that you have read the Profit Maker Review, what do you think about it – is it legit or scam? Do you have any experience with the Profit Maker Method that you want to share? Please leave your comments into the comment section below. Wow, this is such a horrible scam. I can’t believe there are people that just want to take advantage from everyone. I hope everyone trying to make money online stay away from the Profit Maker. Thanks for sharing your research and all of the information covered in this post, Egon.